EcoAdapt, in collaboration with the U.S. Forest Service and California Landscape Conservation Cooperative (CA LCC) hosted the Adaptation Planning Workshop for the Sierra Nevada June 4-5, 2013 in Sacramento, California. The goal of the workshop was to identify management strategies that will help regionally important ecosystems and species adapt to changing climate conditions and to lay the groundwork for adaptation action. Thirty-two attendees representing 21 public agencies (including national forests), non-governmental organizations, and others participated in the workshop. Collaboratively identify management and conservation goals and objectives for focal resources. Present outcomes of spatial analysis and mapping to facilitate adaptation planning. Develop adaptation strategies to reduce the identified vulnerabilities of resources (from an associated vulnerability assessment workshop) and increase positive long-term outcomes for regional management goals. Create a list of implementation needs to facilitate incorporation of adaptation strategies into regional planning and management activities. Provide climate change adaptation training, resources, support, and tools to participants to extend this process to similar efforts in their own work. Over two days of presentations, discussion and small working groups, managers, scientists, and conservation practitioners identified adaptation strategies for six focal resources: alpine/subalpine systems, Sierra Nevada and southern mountain yellow-legged frogs, yellow pine/mixed conifer systems, red fir systems, wet meadows and fens, and oak woodlands. Refined management goals and objectives for focal resources. Evaluation of management objective feasibility given climate and non-climate stressors. A suite of adaptation approaches and actions for each focal resource that can be implemented to help achieve management objectives in the face of climate change. 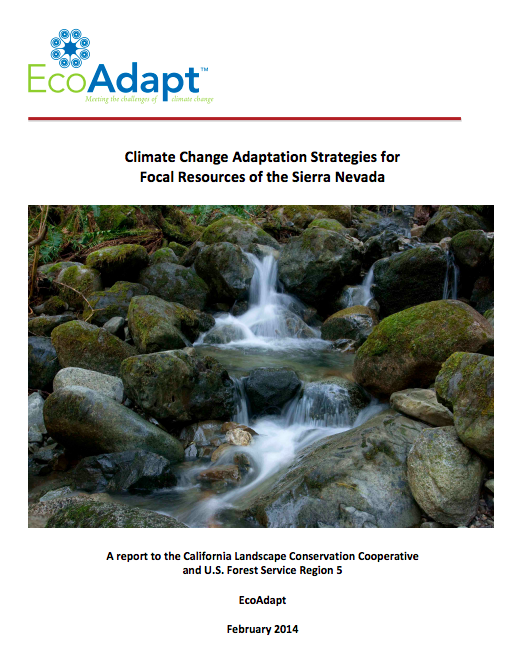 A prioritized list of adaptation actions for resources across the Sierra Nevada. Group-developed implementation plans for prioritized actions. Participants identified a suite of adaptation actions for each of the focal resources and developed draft implementation plans for priority actions. Example adaptation actions for each focal resource considered are described below. Details of these and other workshop-derived adaptation actions are presented in Sections 3-7.